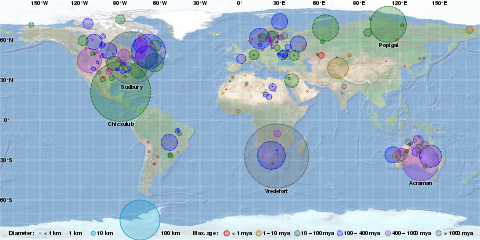 This list of impact craters on Earth contains a selection of the 190 confirmed craters given in the Earth Impact Database. To keep the lists manageable, only the largest craters within a time period are included. The complete list is divided into separate articles by geographical region. These features were caused by the collision of meteors (consisting of large fragments of asteroids) or comets (consisting of ice, dust particles and rocky fragments) with the Earth. For eroded or buried craters, the stated diameter typically refers to the best available estimate of the original rim diameter, and may not correspond to present surface features. Time units are either in thousands (ka) or millions (Ma) of years. Less than ten thousand years old, and with a diameter of 100 m (330 ft) or more. The EID lists only seven or eight such craters, and the largest in the last 100,000 years (100 ka) is the 4.5 km (2.8 mi) Rio Cuarto crater in Argentina. However, there is some uncertainty regarding its origins and age, with some sources giving it as < 10 ka while the EID gives a broader < 100 ka. The Kaali impacts (c. 2000 BC) during the Nordic Bronze Age may have influenced Estonian and Finnish mythology, the Campo del Cielo (c. 2000 BC) could be in the legends of some Native American tribes, while Henbury (c. 2200 BC) has figured in Australian Aboriginal oral traditions. For the Rio Cuarto craters, 2002 research suggests they may actually be aeolian structures. The EID gives a size of about 50 m (160 ft) for Campo del Cielo, but other sources quote 100 m (330 ft). From between 10 thousand years to one million years ago, and with a diameter of one km (0.62 mi) or more. The largest in the last one million years is the 14-kilometre (8.7 mi) Zhamanshin crater in Kazakhstan and has been described as being capable of producing a nuclear-like winter. However, the currently unknown source of the enormous Australasian strewnfield (c. 780 ka) could be a crater about 100 km (62 mi) across. From between 1 and 10 million years ago, and with a diameter of five km (3.1 mi) or more. If uncertainties regarding its age are resolved, then the largest in the last 10 million years would be the 52-kilometre (32 mi) Karakul crater which is listed in EID with an age of less than five Ma, or the Pliocene. The large but apparently craterless Eltanin impact (2.5 Ma) into the Pacific Ocean has been suggested as contributing to the glaciations and cooling during the Pliocene. Craters with a diameter of 20 km (12 mi) or more are all older than 10 Ma, with the exception of Karakul (52 km (32 mi)) and the newly-discovered Hiawatha crater (31 km (19 mi), but not yet in the EID) whose ages are uncertain. There are more than forty craters of such size. The largest two within the last hundred million years have been linked to two extinction events: Chicxulub for the Cretaceous–Paleogene and the Popigai impact for the Eocene–Oligocene extinction event. The largest unconfirmed craters 200 km (120 mi) or more are significant not only for their size, but also for the possible coeval events associated with them. For example, the Wilkes Land crater has been connected to the massive Permian–Triassic extinction event. The sortable table has been arranged by diameter. Note: A special case, the recently discovered Hiawatha crater (31 km (19 mi)) in North-Eastern Greenland, is not yet officially in the Earth Impact Database and is not large enough for this table. But if its age is indeed within the recent Pleistocene, then it will be notable for its possible coeval and environmental effects. The second Greenland crater discovered nearby to the southeast falls into this category as well. As of 2017[update], the Earth Impact Database (EID) contains 190 confirmed craters. [example needed][specify] The table below is arranged by the continent's percentage of the Earth's land area, and where Asian and Russian craters are grouped together per EID convention. The global distribution of known impact structures apparently shows a surprising asymmetry, with the small but well-funded European continent having a large percentage of confirmed craters. It is suggested this situation is an artifact, highlighting the importance of intensifying research in less studied areas like Antarctica, South America and elsewhere. ^ a b "Rio Cuarto". Earth Impact Database. University of New Brunswick. Retrieved 2009-08-19. ^ Haas, Ain; Peekna, Andres; Walker, Robert E. "Echoes of Ancient Cataclysms in the Baltic Sea" (PDF). Electronic Journal of Folklore. Retrieved 2008-10-26. ^ Benítez, Giménez; López, Alejandro M.; Mammana, Luis A. "Meteorites of Campo del Cielo: Impact on the indian culture". ^ a b c Bobrowsky, Peter T.; Rickman, Hans (2007). Comet/asteroid impacts and human society: an interdisciplinary approach. Springer. pp. 30–31. ISBN 978-3-540-32709-7. ^ Hamacher, Duane W.; Goldsmith, John. "Aboriginal oral traditions of Australian impact craters" (PDF). ^ Stankowski, Wojciech; Raukas, Anto; Bluszcz, Andrzej; Fedorowicz, Stanisław. "Luminescence dating of the Morasko (Poland), Kaali, Ilumetsa, and Tsõõrikmäe (Estonia) meteorite craters" (PDF). ^ Cione, Alberto L. et al. (2002). Putative Meteoritic Craters in Río Cuarto (Central Argentina) Interpreted as Eolian Structures, Earth, Moon, and Planets 91 (1), 9-24. ^ "Agoudal". Earth Impact Database. University of New Brunswick. Retrieved 2016-08-18. ^ University of New South Wales (19 September 2012). "Did a Pacific Ocean meteor trigger the Ice Age?". Retrieved 8 October 2012. ^ "Kara-Kul". Earth Impact Database. University of New Brunswick. Retrieved 2009-08-15. ^ Gurov, Eugene P.; Gurova, H. P.; Rakitskaya, R. B.; Yamnichenko, A. Yu. (1993). "The Karakul depression in Pamirs - the first impact structure in central Asia" (PDF). Lunar and Planetary Science. XXIV: 591–592. ^ "Russia's Popigai Meteor Crash Linked to Mass Extinction". 13 June 2014. ^ Cohen, Benjamin E.; Mark, Darren F.; Lee, Martin R.; Simpson, Sarah L. (2017-08-01). "A new high-precision 40Ar/39Ar age for the Rochechouart impact structure: At least 5 Ma older than the Triassic–Jurassic boundary". Meteoritics & Planetary Science. 52 (8): 1600–1611. Bibcode:2017M&PS...52.1600C. doi:10.1111/maps.12880. ISSN 1945-5100. ^ Gorder, Pam Frost (1 June 2006). "Big Bang in Antarctica – Killer Crater Found Under Ice". Ohio State University Research News. Archived from the original on 6 March 2016. ^ Dachille, Frank (1976). "Frequency of the formation of large terrestrial impact craters". Meteoritics. 11: 270. Bibcode:1976Metic..11..270D. ^ Rocca, Maximiliano C. L.; Rampino, Michael R.; Presser, Jaime Leonardo Báez (2017). "Geophysical evidence for a large impact structure on the Falkland (Malvinas) Plateau". Terra Nova. 29 (4): 233–237. doi:10.1111/ter.12269. ^ Osborne, Hannah (5 May 2017). "Crater Potentially Linked to the Biggest Mass Extinction Event in Earth's History is Discovered". Newsweek Tech & Science.